This is the third in a series of 10 special Politics Daily columns to complement C-SPAN's broadcasts this fall of audiotape recordings of some of the most famous and important Supreme Court oral arguments of the past 50 years. The C-SPAN broadcasts will afford most Americans their first opportunity to hear the actual words spoken by the justices and the lawyers before them in arguments that shaped the law that has shaped our lives in countless ways. The third featured tape in the series, focusing on the Washington v. Glucksberg right-to-die/assisted suicide argument in 1997, will be heard on C-SPAN Radio at 6 p.m. ET on Saturday, Oct. 16. Subsequent tapes will be aired each Saturday evening until Dec. 18. The first in this series, on the Miranda warning, can be found here. The second, on flag-burning and the Constitution, can be found here. Does the Constitution give a person the liberty to choose death over life? The Supreme Court in 1997 faced that question in Washington v. Glucksberg and it did so at a time in our nation's history when the question of the morality and the legality of assisted suicide was very much a subject of intense public debate. Much more so than today. The popularity (many say infamy) of Dr. Jack Kevorkian, a Michigan doctor who became (and remains) a universal symbol of the issue, was perhaps at its peak. In fact, the case was decided two weeks after jury selection began in the fourth Michigan trial of Kevorkian based upon his conduct in assisting the elderly to die by administering lethal doses of medication. The plaintiffs in Washington v. Glucksberg were four doctors, three very ill patients, and a nonprofit group which counseled patients who were contemplating assisted suicide. They sued to overturn Washington's law, which criminalized assisting or aiding or abetting in suicide. The three patients died before the Supreme Court decided the case. Their lawyers argued that they have a constitutional due process right -- a liberty interest -- in choosing the manner of their death. 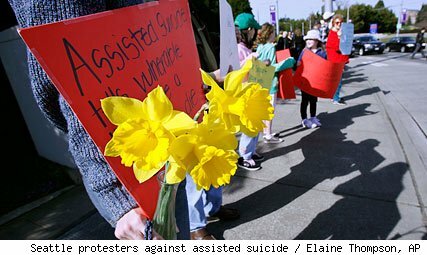 Washington's attorney general argued that no such fundamental right existed -- so that the state law precluding legal assisted-suicide was a justifiable infringement upon an individual's personal choice. C-SPAN's Supreme Court Broadcasts: Do You Have the Right to Burn the Flag? This is the second in a series of 10 special Politics Daily columns to complement C-SPAN's broadcasts this fall of audiotape recordings of some of the most famous and important Supreme Court oral arguments of the past 50 years. The C-SPAN broadcasts will afford most Americans their first opportunity to hear the actual words spoken by the justices and the lawyers before them in arguments that shaped the law that has shaped our lives in countless ways. 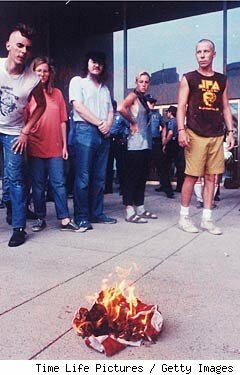 The second featured tape, of the Texas v. Johnson argument over flag-burning in 1989, will be heard on C-SPAN Radio at 6 p.m. ET on Saturday, October 9. Subsequent tapes will be aired each Saturday evening until December 18. Like this one below, subsequent articles will preview each taped argument. Just a month or so removed from an international controversy involving a threat by a Florida pastor to burn the Koran, and just a few days removed from the emotional funeral protest case heard by the Supreme Court, it is altogether fitting that we hear this week from the justices and the counsel before them an earnest debate over the constitutionality of a state statute that made it a crime to burn one of our national symbols, the American flag. In the 1989 case of Texas v. Johnson, a divided United States Supreme Court declared 5-4 that the First Amendment to the Constitution barred Texas from criminalizing the "desecration" of a state or national flag. Few cases in recent memory stirred such emotive writing from the justices as they struggled with the proper scope of the protections the free speech clause gave to symbolic speech. And when it was all over, the ruling marked a rare occasion indeed upon which both the most conservative justice on the Court, Antonin Scalia, and its most liberal justice, William Brennan, agreed. Justice Brennan wrote the majority opinion.